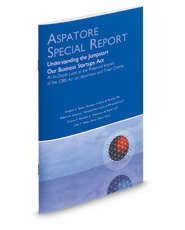 This Aspatore legal title provides feedback from some of the nation's leading legal minds on the pros and cons of the newly enacted Jumpstart Our Business Startups Act, the ways in which it seeks to make it easier for companies to raise capital, and ultimately the intent to increase job creation. These experts speculate on the short- and long-term impact of this law and offer advice to fellow attorneys on new issues they will have to face as a result. This report offers readers an on-the-spot look at this issue as it continues to unfold.